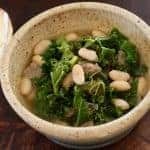 Kale Turkey Bean Soup is quick to fix comfort food. Full of fiber and flavor, it’s ready in 30 minutes. 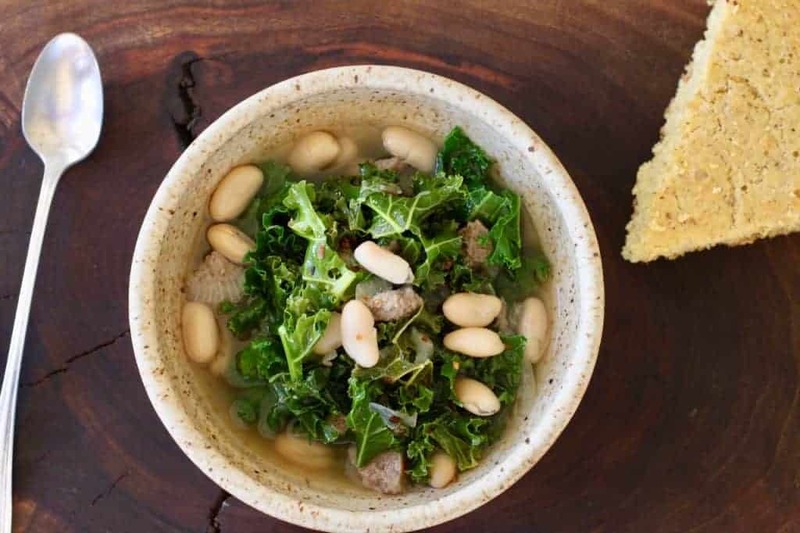 This easy, hearty soup is a kale soup recipe perfect for winter. The weather has changed. It was below freezing when I walked Beau this morning. In snow. I’m happier when socks are not required. When I wear flip flops or sandals. But when socks are required, I’m a ThorLo gal. I love the cushion, the way they hug my feet and how long they last. I also love how comfy they are. I have never had a blister wearing ThorLos. Never. I’ve worn them hiking around Macchu Pichu, on a safari in Kenya, on morning walks and runs with Beau and the tennis court. In writing this, I learned that ThorLos are made in the USA. The company passion is to be caretakers of the world’s feet. I like that. Even without knowing their mission, they’ve been taking care of my feet for more than 10 years. ThorLo socks are usually on my Christmas list. And here’s an irony. I’m grumbling about sock weather and today is #WorldMentalHealthDay. Maybe I need an attitude adjustment. I need some soul food. So I made soup and pulled on my socks. Reluctantly. My Comfort spoon by MilkandHoneyLuxuries.com was a gift from Sheila. Just seeing the spoon felt like a hug. 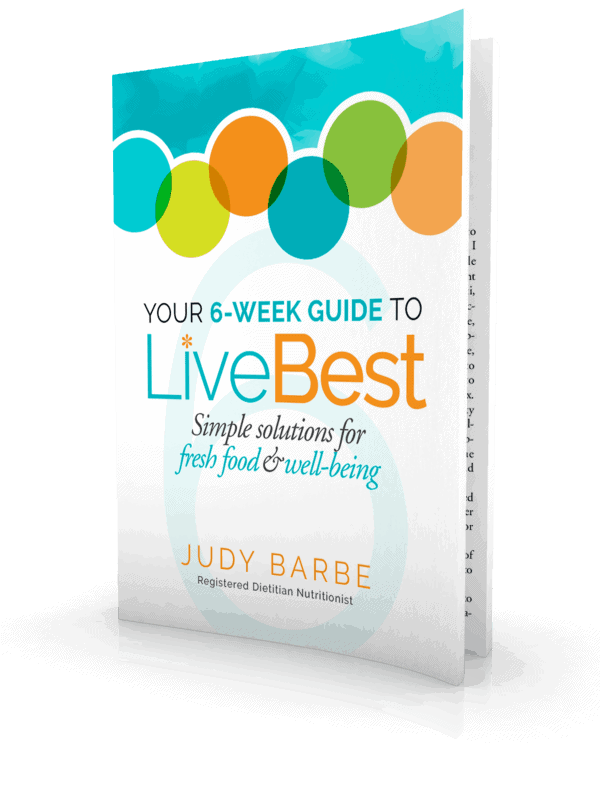 In my book, Your 6-Week Guide to LiveBest, I write about how we feed our soul. I had 3 doses of soul food today. Woohoo!! APPRECIATE…what you have, what you can give back and what you have received from others. Like a spoon. CONNECT…with others. Good people give you energy. Invite friends to do something or call a friend to catch up. Eating together is even better. 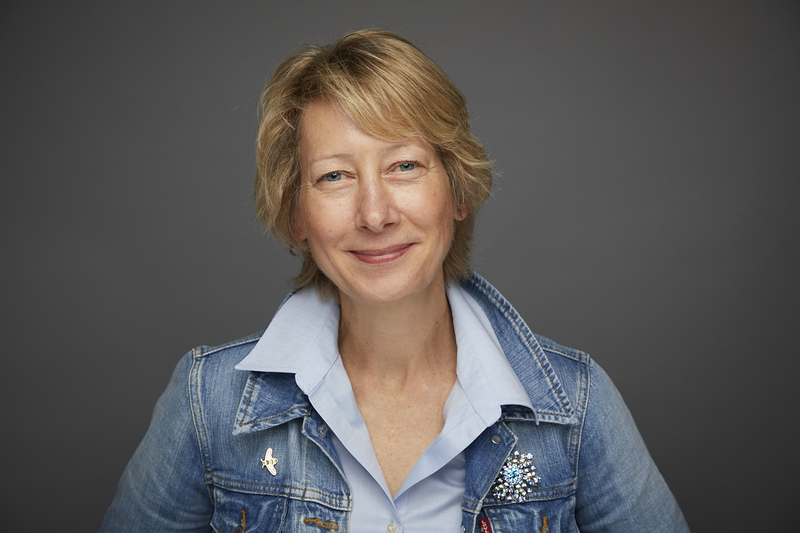 I checked in with Sheila, the spoon giver, when I was writing this post to show her how I used her spoon. ENJOY…what makes you feel light and open. Don’t miss the moment—be it a sunset, a great bite of food, a compliment or a smile. Like a bowl of soup. the health benefits of kale. Kale is high in cancer-fighting compounds and vitamin A. It can be a tough green to like because the older the green, the tougher and the stronger flavor it has. Cooking mellows that so it’s great in a soup. the health benefits of beans. 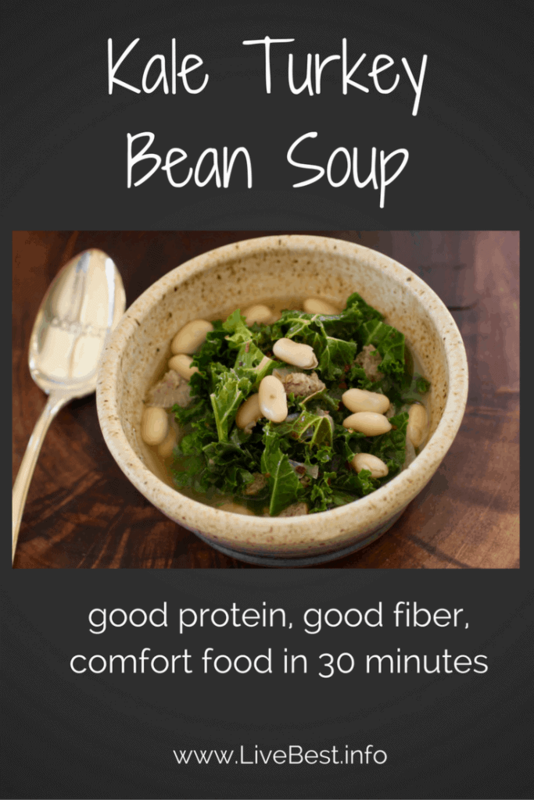 Beans are budget friendly and a top fiber source. All ingredients can be stored in freezer or pantry, so this is a go-to dinner solution. It’s ready in about 30 minutes. My husband is happy he’s eating some version of sausage. Because of my fiber challenge, I’m looking to add more fiber to recipes. Beans, kale, onion are the fiber sources here. I created a free, 5-day challenge you can join by clicking this link. You’ll get tips and tools, resources and recipes to create your own roadmap to meet your fiber goals. Find it right here. 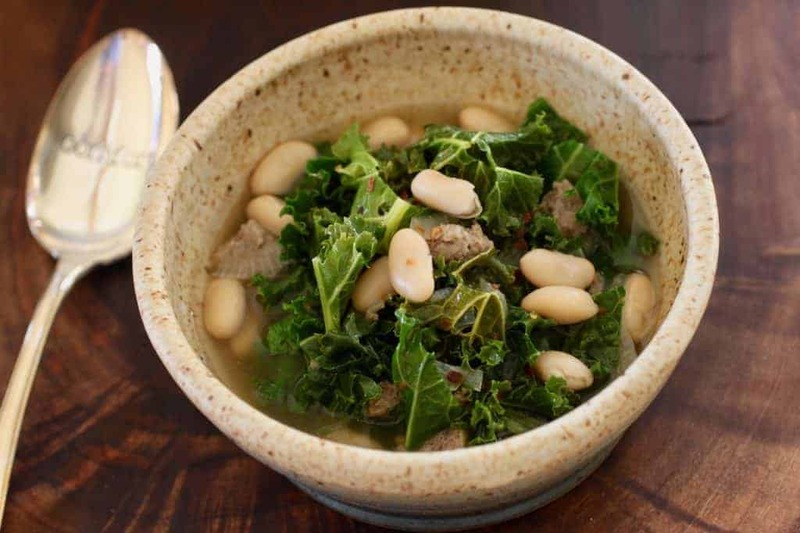 Kale Turkey Bean Soup is a hearty soup that is easy to make and quick to fix comfort food. Full of fiber and flavor, it’s ready in 30 minutes. Soup: In a large pan over medium heat, heat oil and onion. Cook onion until softened, stirring occasionally, 8-10 minutes. Add garlic, cook one minute, stirring regularly. Add turkey and cook, stirring occasionally to break it up into large crumbles, until the sausage begins to brown, about 10 minutes. Add kale, thyme, chile flakes, broth, and water, bring to a boil. Stir, reduce heat to simmer the soup until kale is tender, about 10 minutes. Add beans and vinegar, stir, heat through. Collard greens, Swiss Chard or spinach may be substituted for the kale. If the stems seem tough, trim them before cooking. My website contains some affiliate links. That means if you click through on a link I may earn income from the seller, not the buyer, you. My intent is to be a resource for you. I only refer to products that I support and use. All of the food photos are my own, unless otherwise stated. If you’d like to use one, please seek my permission first. The content of the website and blog are copyrighted. Making soup? Walking your dog? You may like these.